Hello and welcome to another PINK Saturday, hosted by Beverly at How Sweet the Sound! Be sure to visit her and find out where you can find MORE pink! This week I'm sharing these vintage reverse painted shades I just bought for the bathroom! They arrived today, and they're gorgeous. One has a chip, but I only need three. Kevin said we'd be keeping the light fixture that we had~ hmpf~ he didn't say anything about the shades, lol! I love their hourglass shape. These shades were *OK*, but I like the vintage ones MUCH better! As for progress on the bathroom, the beadboard is up and we hope to get the trim on this weekend. Then I need to give it one more coat of paint. Here's the link to the bathroom post if you missed it! It pretty much still looks a lot like this, only the vanity top is on, beadbaord attached. Yes folks, that's a PINK bathroom you see. As Kevin says, welcome to the land of precious! I can hardly wait to see when you are finished. Your husband's comment has me laughing aloud. At least he knows precious when he sees it. Your shades are soooo pretty!! Ooh, now I want to see the light fixture up on the wall!!!!!!! so pretty! Hi Nikki, LOL!..to Kevin's comment, "land of the precious!" You are just that...precious! :) Love your vintage shades! Can't wait to see your bathroom when you finish! It is coming along nicely! I love the shades and the bathroom looks like it is coming along beautifully! Kevin's comment cracked me up! What a great guy he must be!! Okay, si I saw a reflection in the vanity mirror- is that your dining room chandelier??? You have my curiosity goin' and I MUST see a picture of the chandy!!! I have a chandy obcession- can ya tell?? LOL!! 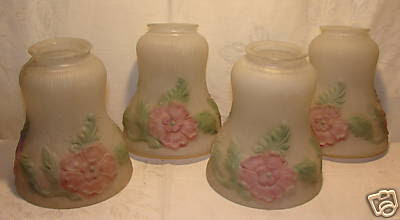 The rose lamp shades are gorgeous. There are so many people in the world of blogging who are remodeling. I wish I had some of that zest for getting things done LOL! I love the pretty pink shades! They are going to look beautiful in your bathroom! Things are moving along well! Your bathroom is going to look great when it's done! Those shades are really lovely and will be perfect. I miss my bathroom at the old house. I also had white beadboard and pink walls, though an even deeper pink than what you had. It had white floors and I had burgundy accessories, and also a dark jade green, and a floral border. *sigh* It was really pretty, and it didn't turn my ex into a sissy (except for the time he tried on my nightgown, but that's a whole different story, lol). Welcome to the land of precious! Okay, that's funny!!! Wonderful shades. Your pink potty room is coming along nicely. Beadboard is a favorite of mine! Instant charm. Those shades are beautiful. They are going to look great! Can't wait to see. The new shades are adorable. Love love love the shades...gorgeous! I've been dying to join Pink Saturday. But I had a post planned for friday that I wanted to leave up a couple of days.Maybe I'll join it for this Saturday. Pink is beautiful and those new shade's WOW !!! Can't wait to see it complete. Oh my, I LOVE those Vintage painted shades!! Can't wait to see the bathroom finished, it will be fabulous! p.s. thanks for dropping by on Pink Saturday! Oh I love the glass shades~they are soooo pretty. I can't wait to see it all done!! The shades are wonderful! You've just gotten the wheels spinning in my head now. 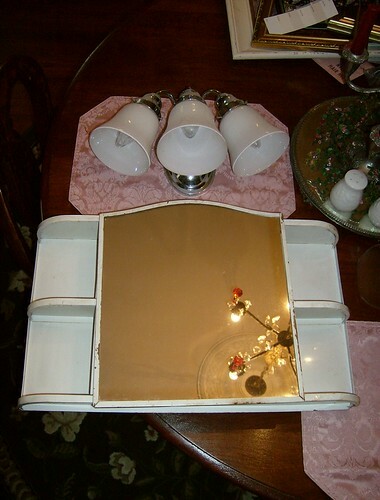 I want vintage shades to trade out the ones I have in my bathroom. Our vanities look very similar except I left my pulls in the center of the panel. I so regret that. I will be going back (sometime) and filling the holes with wood putty/sanding/painting and then have hubby drill new ones. The jadeite pulls are so wonderful too. I really cannot wait to see how you get this bathroom all pulled together. I know it will be so great! I anxiously await the unvieling of your pretty pink bathroom! I like those shades! I have pink ones, of course! Oh, yeah, those shades will look much better than the new ones, although they are nice, too, but the vintage ones are the *pink* icing on the *pink* cake! I love those fixtures! What a find! I see you also live in MO! I live in KC area and grew up near St. Joseph! I am not familiar with the hotel you featured, but it looked wonderful! Your sewing skills are amazing--Ms. Scarlett! I was out of town, so I am trying to check on the Pink Posts! Time Warp Wives on Youtube! First day of Pretty School!